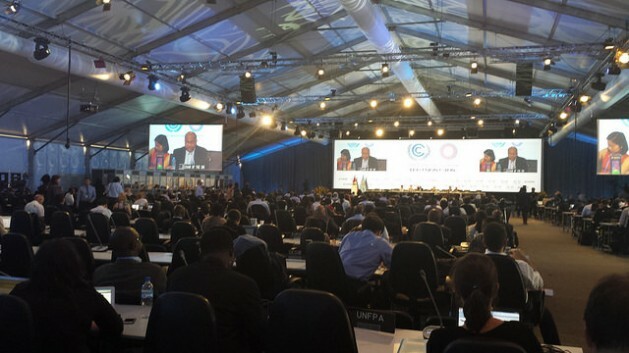 LIMA, Dec 1 2014 (IPS) - At the 12-day climate summit that began Monday in the Peruvian capital, representatives of 195 countries and hundreds of members of civil society are trying to agree on the key points of a new international treaty aimed at curbing global warming. The official delegations and the representatives of organised civil society in the developing South are looking to move forward towards a binding draft agreement on reducing carbon dioxide emissions, to be signed a year from now. Expectation surrounds the commitments that industrialised countries will make on how to finance the fight against climate change and the inclusion of binding targets to reduce the current vulnerability, civil society representatives told IPS. The starting point of the 20th session of the Conference of the Parties (COP20) to the United Nations Framework Convention on Climate Change (UNFCCC) is something that is less and less debated: the current pace of life and model of development lead to emissions of greenhouse gases that are causing global warming. How to reduce climate change and what to do about the damage already caused are two of the most important questions at the climate conference that got underway Monday in the temporary installations built in the San Borja military complex in Lima, known as “el Pentagonito” (the little Pentagon). At the current rate of consumption, the planet will be around four degrees Celsius hotter by 2100 than in the years prior to the industrial revolution, before most of the emissions began. That would cause a dramatic rise in the sea level and drastic changes in soil productivity, glacier size and biodiversity, and the countries least responsible for the emissions would be the hardest-hit: the developing South. Scientists say that severe climate change can only be prevented by keeping the global rise in temperature to a maximum of two degrees. The reduction in greenhouse gas emissions is the route chosen to reach that target. And that is possible by reducing consumption of fossil fuels, increasing the use of clean energy sources, and developing a low-carbon lifestyle. In 2020, the new treaty will replace the Kyoto Protocol, signed in 1997 and in effect since 2005. It is to be signed at COP21, to be hosted by Paris in December 2015. The draft “must mark the end of the fossil-fuel era by 2050 and accelerate the transition to a 100% renewable energy future for all,” said Greenpeace Head of International Climate Politics Martin Kaiser. On the opening day of COP20 the activist said it’s not about energy like nuclear power that is expensive, centralist and dangerous. Governments and civil society groups from the developing South agree it is necessary to seek mechanisms to adapt to climate changes, some of which are considered irreversible. In a report released on the eve of COP20, the international development organisation Oxfam pointed out that both climate change mitigation and adaptation are expensive. In the countries of sub-Saharan Africa alone 62 billion dollars a year are needed to adapt, it said. What we can hope for, what developing countries are looking for in the national contributions, is a guarantee that financing will have a place in the accord, somewhere, because that is something we’re not seeing right now, Oxfam climate policy adviser Kiri Hanks told IPS. The activist said there is still debate on how to implement financing for the fight against climate change, but whether in this agreement, in the contributions or elsewhere, there is a need for parity between mitigation and its financing. Industrialised countries have burned more fossil fuels and deforested faster for centuries, which means their total emissions are greater than those of developing nations. For that reason, an agreement was reached for industrialised nations to finance the Green Climate Fund, with a contribution of 100 billion dollars by 2020. But few funds have been forthcoming so far, say both activists and official delegates. Tasneem Essop, the Head of Strategy and Advocacy for the International World Wide Fund for Nature (WWF), said negotiators have to reach agreements on the draft protocol, including a mechanism to review the contributions, that would review both ambition levels and emissions. She said her group wanted to see a mechanism that translates this review into ambition levels. It also wants to see adaptation as part of the text, but with the necessary financial backing. Essop said civil society has come to Lima strengthened by mass demonstrations in the past few months, with simultaneous marches in cities around the world, demanding action against climate change. She also said recent announcements of emission reduction commitments by the EU and by China and the United States were encouraging. But she said the lack of commitment makes it difficult to think that measures that challenge the current model of development will be put in place by 2020. Maurtua agrees that there is a lack of commitment, especially when it comes to funding. “The route to getting the 100 billion dollars needed by 2020 needs to be established in the Lima draft,” to put the new climate change treaty into effect, he said.